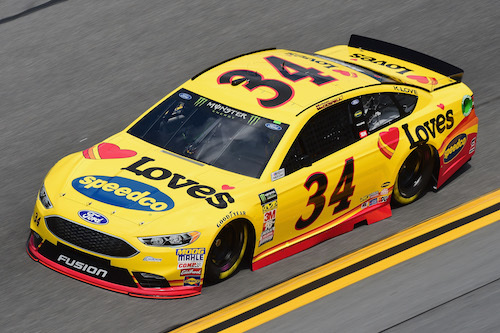 On Wednesday, Front Row Motorsports revealed its Monster Energy NASCAR Cup Series crew-chief lineup for 2019, announcing that Drew Blickensderfer will be the crew chief on the No. 34 Ford team of Michael McDowell, and Mike Kelley will be the crew chief for Matt Tifft on the No. 36 team. Derrick Finley, who was crew chief on the No. 34 team last year, remains with FRM, moving to the position Technical Director. The No. 36 team is a new team at Front Row as the team expands from two to three teams ahead of the 2019 season. Seth Barbour remains David Ragan’s crew chief on the No. 38 Ford team. Blickensderfer joins FRM from Richard Petty Motorsports, where he had been a crew chief since 2012. He has been a Cup Series crew chief since 2009, working at Roush Fenway Racing before the move to RPM. At RFR, he was a three-time winner, guiding Matt Kenseth to two wins in 2009 and Ragan to a win in 2011. He has 272 races of experience as a Cup Series crew chief, resulting in three wins, 20 top-fives and 52 top-10 finishes. Blickensderfer also is a 12-time winner as a NASCAR Xfinity Series crew chief. Kelley has been a crew chief in 36 Cup Series, all with Ricky Stenhouse Jr. Thirty-five of those races were in 2014. He last competed as a Cup Series crew chief for a single race in 2016. Most of Kelley’s experience comes from the Xfinity Series, where he has been a crew chief for 300 races between 2006 and 2018. He was crew chief on the No. 60 Roush Fenway Racing Ford team in the Xfinity Series last year, working with drivers Chase Briscoe, Austin Cindric and Ty Majeski. Kelley was crew chief for Stenhouse for back-to-back Xfinity Series championships in 2011 and 2012. Barbour joined Front Row Motorsports midway through the 2017 season as crew chief on the No. 34 team. He moved to the No. 38 team last year.